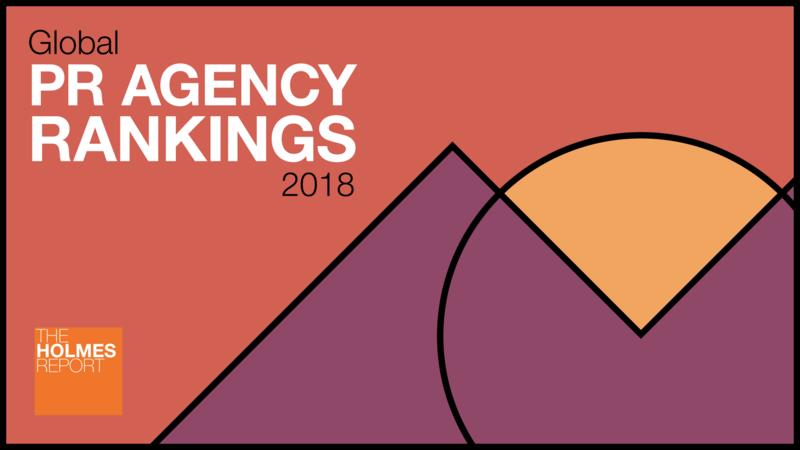 Global PR agency ranking: Revenue numbers for many agencies include subsidiaries—including research, advertising, and specialist PR firms—many of which operate under separate brands but nevertheless report into the listed PR agency. Full methodology here. For firms that submitted numbers in pounds sterling, euros or other non-USD currencies, conversions were made using exchange rates as of 12/31/2017. In some cases, where last year’s submitted numbers were used for comparison purposes, growth numbers may be lower because of exchange rate fluctuations than they would have been in constant currency terms. Accordingly, we also include a constant currency growth metric. Aside from well-known agencies for which we have estimated fee income, the Rankings are totally dependent on submitted fee income; many agencies, often well-known, choose not to submit their numbers. For entries in this color, The Holmes Report has estimated revenue. In many cases, the parent companies of these firms have elected not to provide revenue numbers for individual firms in response to Sarbanes-Oxley financial regulations.